in protest of the 23 hours of solitary confinement that tens of thousands of prisoners endure every day for months and years. Add your group to those committed to taking an action each month. Two years ago in this month, over 30,000 CA prisoners went on hunger strike to stop the torture of solitary confinement. We honor them and will continue in this struggle until solitary confinement is no more. We will be out on the 23rd of the month, talking with people and providing information to END SOLITARY CONFINEMENT. Please come join us for an hour after the work day. 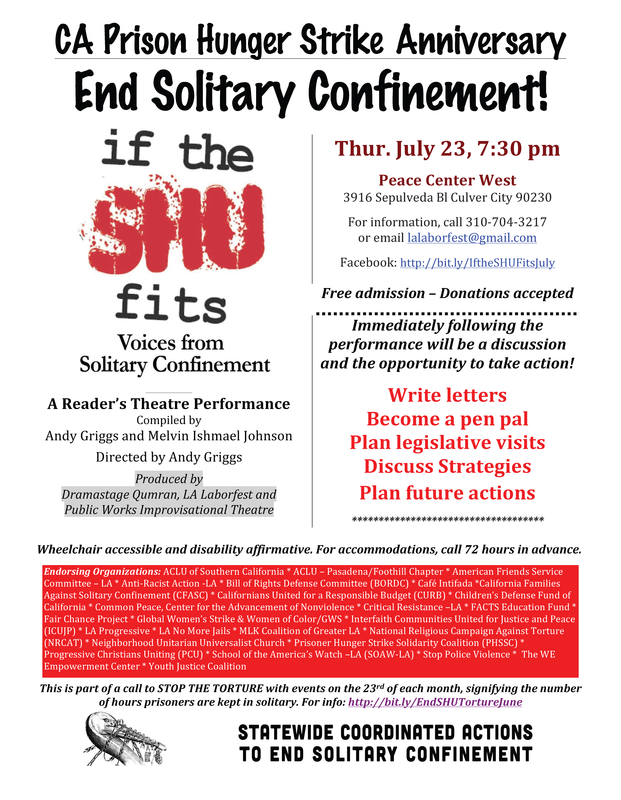 As part of the Statewide Coordinated Actions to End Solitary Confinement on the 23rd of July: we will distribute literature, hold signs, and put up a banner with signs on it — to END SOLITARY CONFINEMENT and to End Israeli Occupation of Palestine. Please join us. Thursday July 23rd, join a coalition of individuals and organizations as we gather for an action in front of O’Neill to stand up against Solitary Confinement, in solidarity with other coalitions all over California and nationwide! First, we will leaflet and talk with passersby. Then, a noon RALLY with updates on Statewide Coordinated Actions To End Solitary Confinement and SB 124 to Define and Limit Youth Solitary Confinement. We’ll also have a Readers’ Theater of the Agreement to End Hostilities, Free Lunch from Food Not Bombs, Free Literature, and a model SHU food tray. Central Coast co-sponsors: American Civil Liberties Union (ACLU) of Northern California; Food Not Bombs; Global Women’s Strike Network; Prisoner Hunger Strike Solidarity Coalition Statewide Coordinated Actions To End Solitary Confinement; Project: Pollinate; Santa Cruz Resistance Against Militarization (SCRAM! ); and Sin Barras. 10 other organizations and prominent individuals are endorsers. 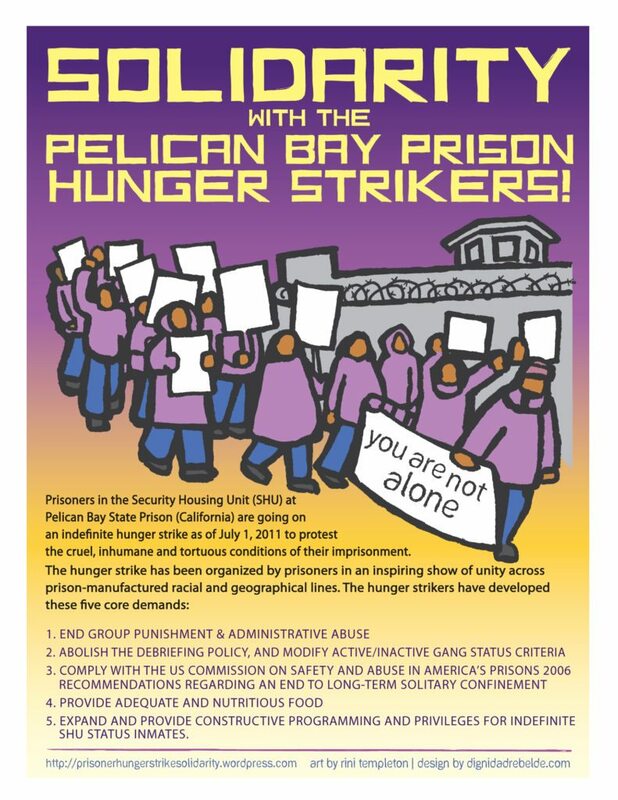 July 8th marked the second anniversary of the beginning of the 2013 Hunger Strike to end solitary confinement and abusive prison conditions. It was the largest Hunger Strike in world history. with over 30,000 people in CA prisons & 100’s of other prisoners throughout the U.S., of all genders, young & old, participating. This Prisoner-class-led Human Rights Movement falls within a long legacy of prisoner-led resistance & is connected to global struggles against inequality and powerlessness, and for self-determination and liberation. We do not want people in prison to have to risk their lives in another Hunger Strike! Take Action. End Solitary Confinement. It is Torture. 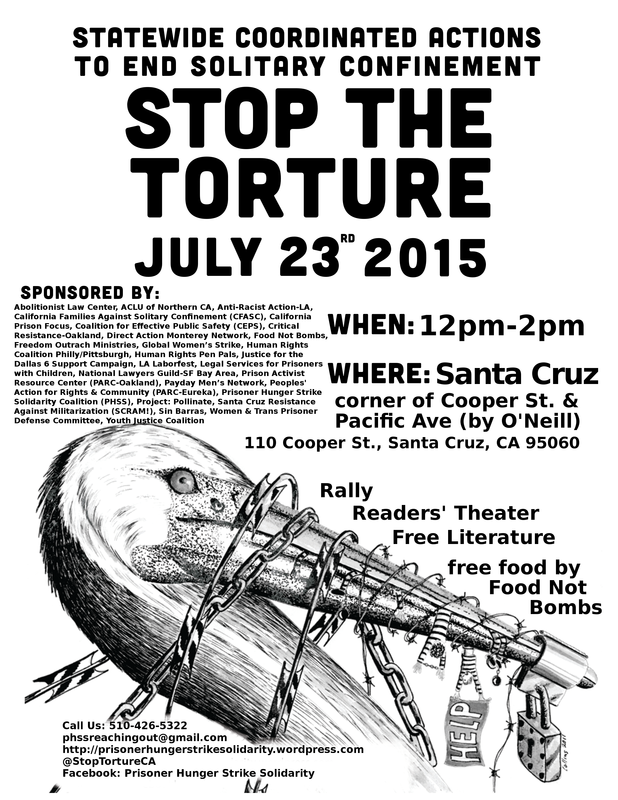 Here‘s the Santa Cruz flier! Friendly Neighborhood Action Committee (805) is honored to join in the Statewide Coordinated Actions Against Solitary Confinement. Join us at the Santa Monica Pier on Thursday evening beginning at 7PM. 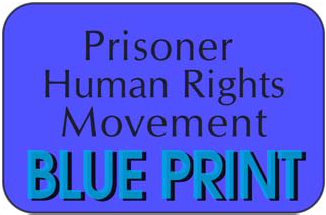 We will be pamphleting in service of the struggle for dignity and humane treatment of prisoners. This effort will take place during the FREE concert series, “Cubanismo,” 200 Santa Monica Pier, Santa Monica CA. As we enjoy the music, let us honor those behind the walls; promote an end to racial hostilities, and fight to end torture. Expose and End Solitary Now! 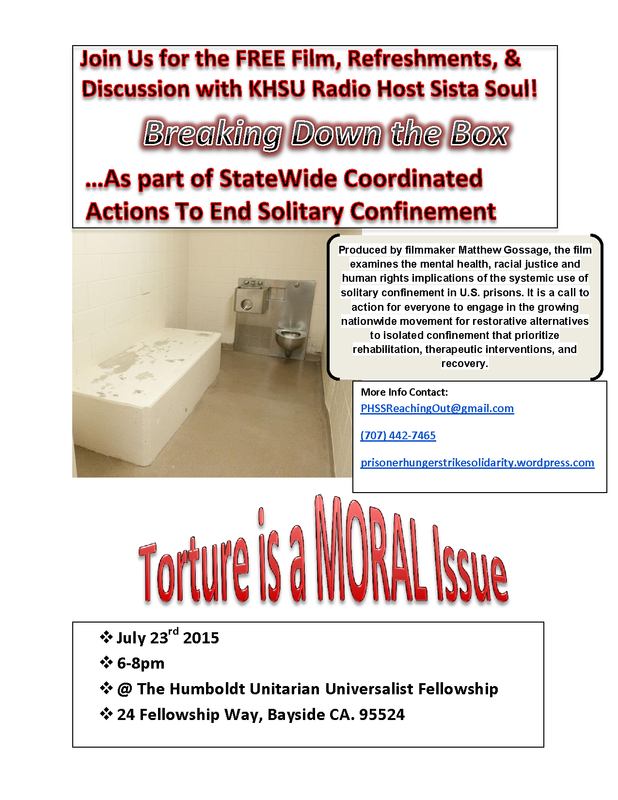 Think Ten Media Group has created a Thunderclap campaign for July 23rd, National Day of Action to End Solitary. The goal is to simply raise awareness of the harsh realities of solitary confinement. It would be great if you could join us now in this effort. It literally takes less than 30 seconds and costs absolutely nothing. Our collective social media “clap” will go out on July 23rd at Noon, PST. You can join us at http://thndr.it/1BQxSFJ. This entry was posted in Uncategorized and tagged #EndSolitary, #StopTorture, #StopTortureCA, #Torture23hrs, 60-day hunger strike, Abolitionist Law Center, ACLU of Northern California, ACLU of Southern California, ACLU-Pasadena/Foothills, Agreement to End hostilities, American Friends Service Committee (AFSC), American Friends Service Committee-LA, Anti-Racist Action-LA, Arcata CA, “stop the torture”, Bayside CA, Bill of Rights Defense Committee (BORDC), Black and Pink San Diego, Black and Pink: Chicago, Boston Massachusetts, Breaking Down The Box, Cabrillo College Justice League, Cafe Intifada, CAIC, California Chapter of the National Association of Social Workers, california department of corrections and rehabilitation, California Families Against Solitary Confinement (CFASC), California Peace and Freedom Party, California Prison Focus, Californians United for a Responsible Budget (CURB), Campaign for Alternatives to Isolated Confinement, CDCR, Center for Constitutional Rights, Chicago Illinois, Children’s Defense Fund of California, City Heights, class action lawsuit, Co-Sponsors, Coalition for Effective Public Safety (CEPS), Collier County Jail, Communities Organized for Relational Power in Action (COPA) Restorative Justice Institutions, Critical Resistance –LA, Critical Resistance Oakland, Cubanismo, Culver City CA, Darrell and Karen Darling, Direct Action Monterey Network, Distribute literature, Donna Wallach, Dr. Nancy Arvold PhD MFT, Dramastage Qumran, Dylcia Pagán, Edoff Memorial Band Stand, Ella Baker Center for Human Rights, End Israeli Occupation of Palestine, Endorsers, extreme isolation, Facebook, Facebook event, FACTS Education Fund, Fair Chance Project, Family of Frank Alvarado Jr., fasting, Fight for Lifers West Inc, Food Not Bombs, former Puerto Rican Political Prisoner held in US prison, Free Our Minds, Free Radio Santa Cruz, Freedom Archives, Freedom Outreach Ministries, Friendly Neighborhood Action Committee, Global Women’s Strike, HALT solitary confinement, Human Rights Coalition Philly/Pittsburgh, Human Rights Pen Pals, Humboldt Unitarian Universalist Fellowship, If the SHU Fits-Voices from Solitary Confinement, Illinois Department of Corrections (IDOC), Interfaith Communities United for Justice and Peace, Iptown People's Law Center, July 8, Justice for Palestinians, Justice for the Dallas 6 Support Campaign, KHSU radio host Sista Soul, LA Laborfest, LA No More Jails (No Mas Carceles), Legal Services for Prisoners with Children (LSPC), Leonard Peltier Support Group Silicon Valley, Los Angeles, Manhattan, member Psychologists for Social Responsibility, MLK Coalition of Greater LA, mock solitary confinement cell, model SHU, model SHU food tray, Naples Florida, National Alliance on Mental Illness (NAMI)-Santa Cruz County, National Day of Action to End Solitary, National Lawyers Guild – SF Bay Area Chapter, National Religious Campaign Against Torture (NRCAT), Neighborhood Unitarian Universalist Church, New York City, New York State, Oakland Alliance (OA), Oakland CA, Oakland’s Lake Merritt, Payday Men’s Network, Peace Center, Pelican Bay hunger strike, Peoples’ Action for Rights and Community, Peoples’ Action for Rights and Community (PARC- Eureka), Philadelphia, Pittsburgh PA, Prison Activist Resource Center (PARC-Oakland), Prisoner Hunger Strike Solidarity Coalition (PHSS), Prisoner-class-led Human Rights Movement, Progressive Christians Uniting (PCU), Project: Pollinate, Public Works Improvisational Theater, Queer Strike, Rabbi Borukh Goldberg, Rally, Ramona Africa and The MOVE Organization, Reader's Theater, Redwood Curtain CopWatch, Rosa Park, San Diego, San Francisco Bay View National Black Newspaper;, San Francisco MIME TROUPE, San Jose, Santa Cruz, Santa Cruz County Community Coalition to Overcome Racism (SCCCCOR), Santa Cruz Resistance Against Militarization (SCRAM! ), Santa Monica, Santa Monica Pier, SB 124 to Define and Limit Youth Solitary Confinement, Security Housing Unit, severe psychological and physical damage, SHU, Sin Barras, social media "clap", South Bay Committee Against Political Repression (SBCAPR), struggle for dignity and humane treatment of prisoners, T’ruah: The Rabbinic Call for Human Rights, The Coalition for Effective Public Safety (CEPS), The WE Empowerment Center, Thompson Center, Thomson Supermax Prison, Thunderclap, Tumblr, Twitter, UNION SQUARE, United Against Police Terror – San Diego, United Nations Special Rapporteur on Torture, US PROStitutes Collective, Women and Trans Prisoner Defense Committee, Women of Color/Global Women’s Strike, Women's Council, Youth Justice Coalition. Bookmark the permalink. This is a multi-state protests of prison conditions – please read the original post to see if there is one near you. Thank you.